By Allan Fox: Promoter Bob Arum wants Manny Pacquiao to be tested at the Cleveland brain clinic in Las Vegas, Nevada to check to make sure there are no lingering problems present from Pacquiao’s brutal knockout loss to Juan Manuel Marquez on December 8th last month. 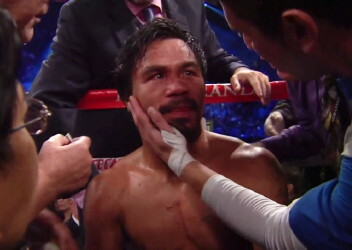 Arum said to the Manila Bulletin “This should clear the air,” perhaps in response to the Filipino Dr. Jimenez, who said he suspected that Pacquiao has early Parkinson’s disease despite never having giving met him before. Pacquiao has already had a CT scan conducted on his brain at the University Medical Center in Las Vegas, Nevada after his loss to Marquez last month. The test results were negative, but Arum wants to make doubly sure that there isn’t a problem that was missed during that examination. Pacquiao reportedly has also had an MRI done at the Cardinal Santos in San Juan. If Pacquiao can pass all the tests at the Cleveland clinic he’ll likely return to the ring in September against Marquez or another opponent. Arum will likely push to make a Marquez vs. Pacquiao fifth fight next because of the high interest and the big money that can be made from that fight. If Arum doesn’t make that fight then the other option for Pacquiao will be a fight against the Top Rank promoted Brandon Rios. That was a fight that Arum had planned on making in April of this year if Pacquiao had beaten Marquez in their fourth fight. It’s a fight that Arum really wants to make, but it’s also a fight that’s far less appealing than a Pacquiao-Marquez 5th fight because Rios doesn’t have much of a fan base and it would be a lot like Arum matching Pacquiao up with Tim Bradley again. Arum is counting on the Mexican fans to back Rios despite the fact that he’s not from Mexico and that’s not that well known yet.